As one of the nation's largest healthcare providers specializing in rehabilitation, HealthSouth's priority is to deliver high quality patient care. Our team of experts has extensive experience in today's most advanced therapeutic methods and technologies. HealthSouth leads the way, consistently outperforming peers with a unique, intensive approach to rehabilitation, returning patients to full strength in less than average time. At HealthSouth we continually strive for excellence in all that we do, partnering with every patient to find a treatment plan that works for them. HealthSouth is dedicated to comprehensive rehabilitation medicine. In the hospital and at home, HealthSouth's team of experts is focused solely on rehabilitation. They collaborate closely on decisions, goals and therapy options. 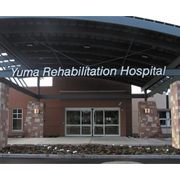 It's a fully cooperative approach to delivering the most advanced rehabilitation care available. HealthSouth is convenient to nearly everyone, with specialized rehabilitation hospitals in 26 states and Puerto Rico. With thousands of employees innovating specialized care across the country, we provide the best technologies and treatment through our network of inpatient rehabilitation hospitals, long-term acute care hospitals, outpatient rehabilitation satellite clinics and home health agencies. All that experience comes together for real-world, outcomes-based rehabilitation success, coast to coast. To be the healthcare company of choice for patients, employees, physicians and shareholders by providing high quality care in the communities we serve. At HealthSouth, the cornerstone of our operations is the delivery of quality healthcare in the most appropriate, safe, patient-centered environment.